New Delhi: India’s factory output contracted unexpectedly in October, the first time in seven months and its worst performance in three years, while retail inflation touched a new low since the series was launched in 2012, strengthening the case for a rate cut by the central bank to spur investment and economic growth. The Index of Industrial Production (IIP) shrank 4.2% in October, data released by the statistics department showed on Friday, dragged down by manufacturing, which contracted by 7.6%. Mining and electricity sectors grew by 5.2% and 13.3%, respectively, during the month. Such a poor performance was last seen in October 2011, when factory output had contracted by 5%. Industrial production was upwardly revised to 2.8% year-on-year in September from 2.5% earlier. However, retail inflation measured by the Consumer Price Index (CPI) eased to 4.38% in November, compared with 5.52% a month ago, as vegetable prices fell by 6.97%. While fuel and light inflation stood at 3.27%, clothing, bedding and footwear inflation rose by 6.97%. The National Democratic Alliance government under Prime Minister Narendra Modi assumed charge in May with a pledge to revive economic growth, which slumped to sub-5% levels for two consecutive years. India’s economic growth slowed down in the fiscal second quarter to 5.3% compared with 5.7% in the June quarter. Finance minister Arun Jaitley has called for a cut in policy rates by the central bank to boost investment since inflation is softening. In its monetary policy review earlier this month, when the Reserve Bank of India (RBI) kept policy rates unchanged despite pressure from the government and industry lobbies to cut rates, the central bank said although November inflation is expected to show a further easing, “the favourable base effect that is driving down headline inflation will likely dissipate and inflation for December may well rise above current levels". Speaking at a function in Delhi on Friday, RBI governor Raghuram Rajan said a central bank focused primarily on keeping inflation low and stable will ensure the best conditions for growth. However, signalling a possible rate cut, he said: “In reacting to developments, however, the central bank has to recognize that emerging markets are not as resilient as industrial economies. So the path of disinflation cannot be as steep as in an industrial economy because an emerging market is more fragile, and people’s buffers and safety nets are thinner." Rajan said a sharp disinflation was never on the cards in India, but a glide path suggested by the central bank’s Urjit Patel committee would ensure moderate growth even while price rise slows down. The Patel panel, in a report on the possible path to be followed by the central bank on monetary policy, had recommended a retail inflation target of below 8% by January next year and 6% by January 2016. “Going forward, we will discuss an appropriate timeline with the government in which the economy should move to the centre of the medium-term inflation band of 2-6%," Rajan said on Friday. RBI in its monetary policy had said a rise in investment is critical for a sustained pickup in economic activity, referring to the weak industrial activity. “While low capacity utilization in some sectors is a dampener, the recent strong improvement in business confidence and in investment intentions should help," the central bank had said. “In this context, the still slow pace of reviving stalled projects, despite government efforts, warrants policy priority, even as ongoing efforts to ease stress in the financial system unlock resources for financing the envisaged investment push." The fall in manufacturing growth in October is disturbing, more so because it is broad-based and not limited to a few sectors, Sidharth Birla, president of industry lobby Federation of Indian Chambers of Commerce and Industry (Ficci), said in a statement. “It not only reflects slowdown in investments but also the deep-rooted slackness in consumer demand, which requires bringing down the interest rates urgently," Birla said. “It would also need faster implementation of government’s intentions to introduce reforms in which states have major role to play." However, a survey by Ficci and consultancy firm PwC, called the India Manufacturing Barometer, on Friday showed that 55% of respondents expect to make major investments over the next 12 months, while 49% of the surveyed companies plan to add capacity. The demand for consumer goods remains fragile, indicating that consumer spending has not picked up even during the festive season, said Madan Sabnavis, chief economist at CARE Ratings. “It is disappointing more so because October is one of the peak spending months when rural incomes increase and two festivals should have prompted consumer spending. It does appear more was spent on gold as imports have increased," he said. 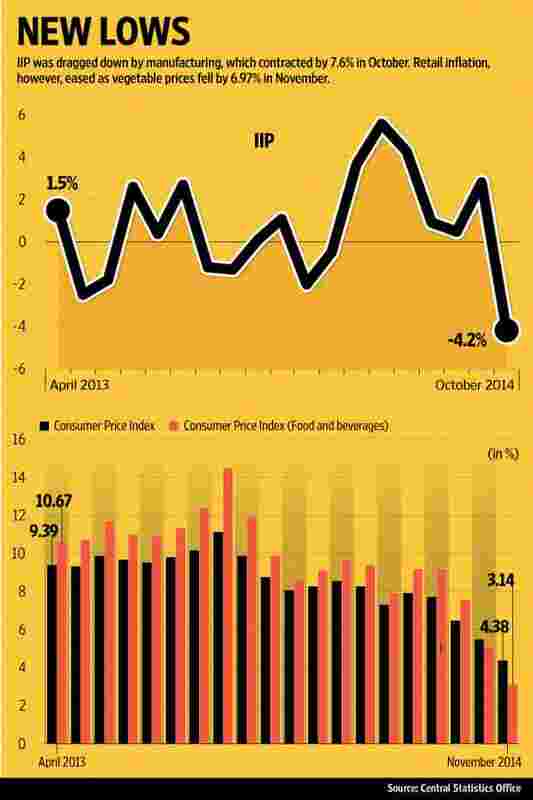 “Low kharif output must have also contributed to a decline in spending on consumer goods." However, Aditi Nayar, senior economist at rating agency Icra Ltd, said given the fewer number of working days on account of the shift in the festive calendar, the sharp contraction in manufacturing output in October should not be a cause for alarm. “Some indicators suggest an uptick in manufacturing output in November 2014. For instance, after contracting by 5% in October 2014, automobile production expanded by 12% in November 2014," she said. “In our view, average growth for October-November 2014 would provide a clearer picture of the evolving trends in factory output in third quarter of FY15." With retail inflation in line with a forecast of 4.4%, Nayar does not expect RBI to advance the rate-cut cycle. The central bank has indicated to cut policy rates after the national budget is presented in Parliament in February.